Science fiction is a genre of speculative fiction, typically dealing with imaginative and futuristic concepts such as advanced science and technology, space exploration, time travel, and extraterrestrials in fiction. Science fiction often explores the potential consequences of scientific other various innovations, and has been called a "literature of ideas." Fantasy Press was an American publishing house specialising in fantasy and science fiction titles. Established in 1946 by Lloyd Arthur Eshbach in Reading, Pennsylvania, it was most notable for publishing the works of authors such as Robert A. Heinlein and E. E. Smith. One of its more notable offerings was the Lensman series. A warp drive is a fictitious superluminal spacecraft propulsion system in many science fiction works, most notably Star Trek and I, Robot by Isaac Asimov. A spacecraft equipped with a warp drive may travel at speeds greater than that of light by many orders of magnitude. 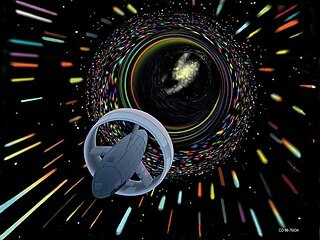 In contrast to some other fictitious FTL technologies such as a jump drive, the warp drive does not permit instantaneous travel between two points, but rather involves a measurable passage of time which is pertinent to the concept. In contrast to hyperdrive, spacecraft at warp velocity would continue to interact with objects in "normal space." The general concept of "warp drive" was introduced by John W. Campbell in his 1931 novel Islands of Space. The novel concerns the adventures of four heroes: Arcot, Morey, Wade, and Fuller. Theodore Sturgeon was an American writer, primarily of fantasy, science fiction and horror. He was also a critic. He wrote approximately 400 reviews and more than 200 stories. The Bridge of Light is a science fiction novel by American writer A. Hyatt Verrill. It was originally published in the Fall 1929 edition of the pulp magazine Amazing Stories Quarterly. It was subsequently republished in book form in 1950 by Fantasy Press in an edition of 2,556 copies. Seeds of Life is a science fiction novel by American writer John Taine. 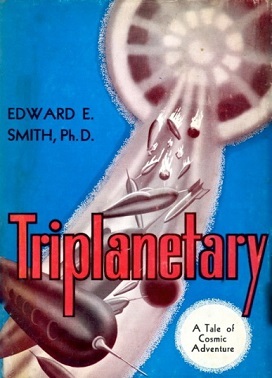 It was first published in 1951 by Fantasy Press in an edition of 2,991 copies. The novel originally appeared in the magazine Amazing Stories Quarterly in October 1931. Without Sorcery is a collection of science fiction and fantasy short stories by American writer Theodore Sturgeon. The collection was first published in 1948 by Prime Press in an edition of 2,862 copies of which 80 were specially bound, slipcased and signed by the author and artist. The stories first appeared in the magazines Astounding and Unknown. The Iron Star is a science fiction novel by American writer John Taine. It was first published in 1930 by E. P. Dutton. "...and some were human." is the first story collection by science fiction writer Lester del Rey, originally published in hardcover by Prime Press in 1948 in an edition of 3,050 copies if which 50 were specially bound, slipcased and signed by the author. The stories first appeared in Astounding and Unknown. An abridged paperback edition, including only eight of the twelve stories, was issued by Ballantine Books in 1961. A Spanish translation, reportedly dropping only one story, appeared in 1957. Chalker, Jack L.; Mark Owings (1998). The Science-Fantasy Publishers: A Bibliographic History, 1923-1998. Westminster, MD and Baltimore: Mirage Press, Ltd. p. 240. Tuck, Donald H. (1974). The Encyclopedia of Science Fiction and Fantasy. Chicago: Advent. pp. 87–88. 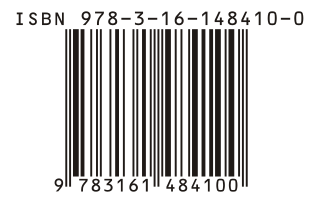 ISBN 0-911682-20-1.